The Charity has 51 bungalows at Hastings built to provide housing for Watermen and Lightermen of the River Thames or their widows/widowers. 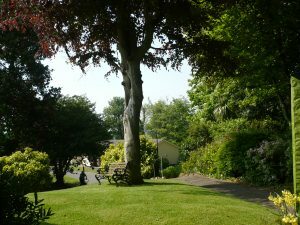 The bungalows are located within an enclosed site just outside of Hastings and offers a safe and secure place to reside. Most of the the bungalows are one bedroom), unfurnished and are maintained to a very high standard. During the last seven years new roofs, guttering, the installation of replacement double glazed windows and new back doors. has taken place. Currently new cold water tanks are being installed to made the bungalows more environmentally friendly. The site has a very pleasant vista with a team of three gardeners who tend the grounds. The Trustees aim to provide convenient and comfortable accommodation in a setting which allows the residents to come and go as they please. All residents are encouraged to make friends and share a wider social life through use of the communal hall located on the site . Many events both on site and at other locations are organised by the Social Club Committee and all residents are most welcome. The Warden lives on site and is responsible for the general up keep of the buildings and grounds. There is an emergency call system in each unit so that in the event of a sudden illness or after a fall, residents can get help quickly. The site has no medical care. Please note that no pets are allowed in the properties. Admission for application to the Almshouse can be made by contacting carol@watermenshall.org or 0207 283 2373 for an application form. Priority is always given to Watermen and Lightermen of the River Thames. The Trustees are keen to encourage Watermen and Lightermen who might not qualify for full charitable support to be admitted as a tenant and offer a significant reduction on the commercial rental to recognise their status as Freemen of the Company.